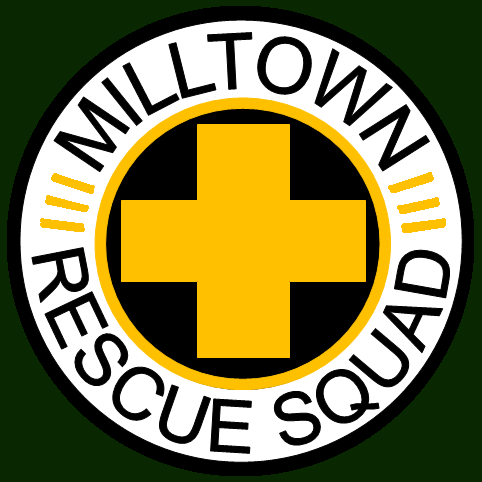 To keep in line with our mission to be provide the best Emergency Medical Services, the Milltown Rescue Squad is proud and excited to announce the next chapter in our history. Beginning July 1, 2018, we have instituted a Cost Recovery Program to aid us in providing you with the best equipment, training and service available. A Cost Recovery Program is a fancy way for saying insurance billing. Insurance billing sounds scary, especially for you, the patient. It sounded scary to us also, however our plan is to minimize the amount of disturbance this will bring to you while continue to provide the same level of service as we always bring. Most insurances allocate benefits for ambulance transportation, and by submitting claims for reimbursement, the goal is to mitigate some of the financial strain incurred through the rising cost of providing health care. The facts of an incident form the basis upon which a claim is created. These facts are recorded by EMTs and paramedics in what are known as Patient Care Reports, or PCRs. Once a PCR is completed, it is provided to a third-party billing company. 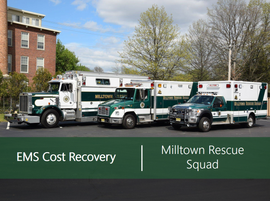 For Milltown and East Brunswick residents, if you are transported to the hospital by the Milltown Rescue Squad, after we render service to you, we will attempt to collect funds from your insurance to offset the cost of your ride. Once your insurance reimburses us, the claim is closed out. You never see a bill from us, to you, asking for money out of your pocket. It's that simple. We only take what your insurance pays, and considering you pay your premiums whether you use us or not, it's a win/win for everyone involved. Other than our new relationship with our billing company, Cornerstone Adminisystems, there will be no change in how the Milltown Rescue Squad operates. You still call 911, and we still take you to the hospital. It does not matter if you have insurance or not. We are still remaining a 100% volunteer operation with service provided 24 hours a day, 7 days a week. Can I Still Donate to the Milltown Rescue Squad? YES! In fact, we still encourage your support. Cost Recovery will only provide a limited amount of funding, your donations will help offset these costs and allow your rescue squad to be well funded. We are still a 501 (c)3 organization, so your donation is tax deductible. Am I automatically charged for calling 911? NO. 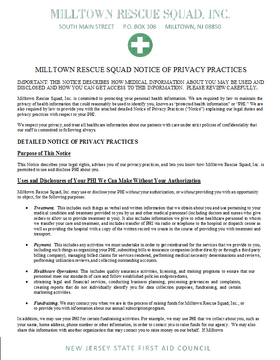 If you call 911, you are not charged unless the Milltown Rescue Squad transports you to the hospital in an emergency. Other services that we provide such as lift assists or care rendered without transport to the hospital is free. However, this should never be a reason for choosing whether or not to call 911. What if the Paramedics treat me on the way to the ER? First and foremost, this decision was made with the best interest of the public in mind. For the last 80 year, public contributions and support have been more than enough to help augment our costs. Being that we absorb almost 100% of our operating budget, your support means a lot. However, while support has always been strong, the cost associated with providing EMS has not been so stable. Training costs have risen as have the standards for being trained. Ambulances are designed to be more safe and efficient but also more expensive. Liability among healthcare providers leads insurance premiums to skyrocket for agencies such as ours. In addition, we are one of the last agencies in the area to not bill for service. All of the surrounding town have been billing for service for many years, with successful outcomes. What other towns in our area have seen similar programs? Again, almost every town in Middlesex County has begun billing for EMS services. There is no evidence that ambulance claims lead to rising premiums. The fact that most insurance policies already contain provisions to cover ambulance transports reflects how carriers anticipate incurring these expenses. Will I be hassled by the Billing Company? No, the program is designed to minimize patient interaction. The extent of this interaction depends on whether or not EMS providers can obtain accurate insurance information and a signature from the patient or representative while on the call. 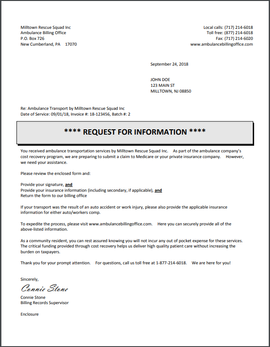 If information is needed, the billing company will send a request for information. In the case of non-residents, up to three invoices will be issued. Why did the EMTs ask for my personal information? We need to maintain a record of every service that we have rendered and your personal information needs to be included to verify your identity and prevent fraud. This information is protected at all times, in accordance with federal laws. We will NEVER release your information without your permission. In addition, this will minimize the need to involve you in the billing process later on. To submit a claim, we need to verify your identity including name, social security number, birth date, home address and telephone number. 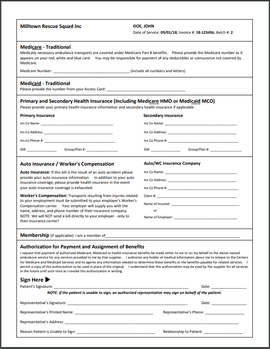 We also may ask for health insurance, automobile insurance or employment information, depending on the situation. Why does if matter if I am a resident? The Borough of Milltown and East Brunswick Township both make financial contributions to us, to offset our costs of operations. Federal law requires that in order to avoid billing residents directly, such subsidies must be made to offset the cost of service for patient's with Medicare. Because both towns have agreed to continue such services, we are able to avoid billing residents directly and thus keep your hard earned money in your pocket! What happens if I am not a resident? If you are not a resident of Milltown or East Brunswick, you are still transported to the hospital. Your claim is processed the same and it is forwarded to your insurance company. If there is a balance left over after insurance pays your claim, we will send you a bill for the balance. As per federal law, this is because the municipality where you live does not subsidize our operations. A total of three bills will be sent to you. If you need assistance paying your bill, please reach out to our billing company for information.